In 1973 the tennis superstar Bobby Riggs, known for his antics and stunts, challenged world champion Billie Jean King to a match. Billed (by Riggs mostly) as a contest between genders it came in the midst of the sexual revolution of the time that included the mainstreaming of feminism and other cultural shifts. The CBS broadcast was a milestone of television, drawing in tens of millions of viewers. The story behind that match is now coming to theaters in Battle of the Sexes. Steve Carell plays Riggs, who wants to stoke the fires of the cultural revolution underway for some self-aggrandizing publicity and a big payday. King, played by Emma Stone, is reluctant to sign on for such a spectacle but ultimately agrees not only out of her fierce competitiveness but also as part of her own search for identity. I’m not sure what the designers were going for with the first poster. The only element here is a tennis ball that has a lit fuse coming out of it, as if it were about to explode. Is this supposed to symbolize that the tennis world was about to blow up because of the events depicted in the story? The rest of the poster is solid yellow (like a tennis court?) but there are visible creases as if we’re looking at a physical poster that’s been folded and stored for a while. That last part, in particular, seems unnecessary and out of context. It’s a meta joke that might work for something like Machete but there’s no winking at the era in this movie. Odd choice. The second poster uses the same visual conceit of the tennis ball that’s about to explode like a grenade set against a yellow backdrop. The main addition here is the photo of Carell and Stone at the top that’s pulled from the recreation of the famous press conference with the two tennis greats they’re playing. Two versions of that poster seem to have been created, one that keeps the photo shaded in the same yellowish-green as the rest of the image and one with an unfiltered version of the photo. The first trailer starts out with Riggs at a support group meeting that he disrupts, exposing him as a shameless opportunist. He calls King to propose a matchup where the central idea is “male chauvinist pig versus hairy-legged feminist.” It’s clear Riggs will do and say anything for a headline and King just has to deal with all that insanity and do the best she can. Her goal is not just to win but, to some extent, upset the patriarchy that’s in place and upend some social norms. There’s lots of glitz and flash on display here. Carell is clearly in full “go for it brash and loud” mode as he embraces the showier aspects of Riggs’ character. Stone plays her emotions closer, wanting to effect change but also win. There are also shots of her then-hidden life as a lesbian in an effort to make it more timely for today’s audiences. The use of an Elton John song is also a great touch given John’s marriage to King around this time, an effort to hide each one’s true sexual orientation. 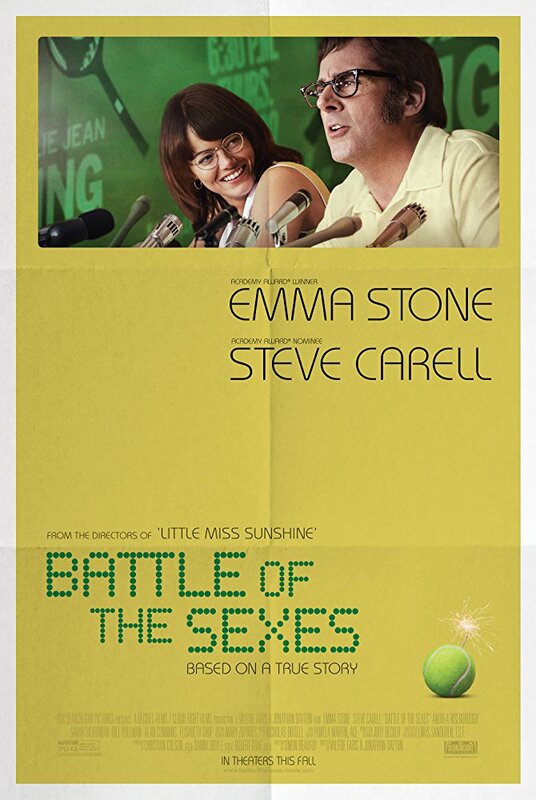 Fox Searchlight’s website for the movie uses the same yellow/green as the key art and opens by playing the trailer. The same photo we’ve seen for a while is on the main page after the trailer is closed, accompanied by a carousel of positive critic’s quotes, encouragement to buy tickets and links to the movie’s Facebook, Twitter and Instagram profiles. Moving up to the content menu at the top, “Cast” allows you to click on each of the major players in the movie and see both a picture of them in character and read a quote from that actor on the real person they’re playing. The same format is used in “Filmmakers.” “Story” offers a brief plot synopsis. As far as I can tell, “Photos” only has the one image, the same still that was used in the initial publicity volleys for the movie. “Videos” just as the one trailer. Finally, “Partners” has the companies that have signed on to help promote the film. TV advertising started off just a week or so before release with spots like this one that played up the showmanship of Riggs and the determination of King, showing the spectacle that surrounds the match they’re planning. Atria Senior Living, which has a partnership with Billie Jean King to promote healthy living for seniors. Billie Jean King Leadership Initiative, which is focused on empowering the next generation of leaders. Citizen, created a new watch…sorry, “timepiece”… the purchase of which helps support King’s above group. Crunch Fitness, which had their Grand Slam Soiree events at locations across the country “powered by” the movie. Orbitz, but I couldn’t find details on what this entails. Title Nine, which interviewed King about the history of gender equality in sports and the statute that formalizes that need for that parity. Tory Burch Foundation, which created a custom t-shirt celebrating the real-life match portrayed in the movie. Wilson, which of course is going to use the opportunity to promote tennis and its line of products. The publicity campaign started as soon as filming began with the release of an official still that resembled a famous photo from the actual King/Riggs press conference. Of course as with anything remotely political these days, Stone was asked about how this chapter of history relates to the continued struggles of today, including the fight for pay equality in Hollywood. She was later interviewed by EW for its fall movie preview about preparing to play a real person, coming to terms with all the sometimes odd and inconsistent elements of King’s life and personality and more. The movie was announced as one of those that would screen at the Toronto International Film Festival. It was also later confirmed for the BFI London Film Festival. The movie’s festival screenings, including Telluride, resulted in powerfully positive buzz, especially for Stone’s performance. EW’s fall movie preview included a story about how the filmmakers recreated the legendary tennis match that was the culminating event in the clash between the two players. Stone was interviewed jointly with King where the actress talked about getting to know the real woman she’s playing and the tennis legend talked about the real story she lived through. Both actors also made some late night and morning talk show appearances to be charming and talk about the movie and hit similar notes as the rest of the publicity campaign. The strongest thing this movie has going for it, I think, is the positive word of mouth that’s coming out of the recent festival appearances. That’s coming at a good time, when it could snowball into more mainstream buzz. At the very least it indicates that word of mouth among the general public could help power box-office turnout. It’s a good thing too since I’m a bit surprised there wasn’t at least one more trailer and that the TV advertising seemed to start so late in the game. I know it’s late summer and all that, but still, we could have used a bit more. That being said, what’s here is plenty attractive. It’s an interesting story to be revisiting at this point in time, with gender identity and roles so much in the spotlight of our daily cultural conversations. I’m surprised there wasn’t more of an effort to lean into that in the campaign but also just as surprised the movie hasn’t become a right-wing lightning rod as the denounce the libs who want to demean the position of men. Either way, the movie has received a good campaign that highlights the stars and positions at as a story that’s certainly timely.